It is my sincere hope that when I say OWASP Zed Attack Proxy (ZAP), you say "Hell, yeah!" rather than "What's that?". This publication has been a longtime supporter, and so many brilliant contibutors and practitioners have lent to OWASP ZAPs growth, in addition to @psiinon's extraordinary project leadership. OWASP ZAP has been 1st or 2nd in the last four years of @ToolsWatch best tool survey's for a damned good reason. OWASP ZAP usage has been well documented and presented over the years, and the wiki gives you tons to consider as you explore OWASP ZAP user scenarios. One of the more recent scenarios I've sought to explore recently is use of the OWASP ZAP API. The OWASP ZAP API is also well documented, more than enough detail to get you started, but consider a few use case scenarios. First, there is a functional, clean OWASP ZAP API UI, that gives you a viewer's perspective as you contemplate programmatic opportunities. OWASP ZAP API interaction is URL based, and you can invoke both access views and invoke actions. Explore any component and you'll immediately find related views or actions. Drilling into to core via http://localhost:8067/UI/core/ (I run OWASP ZAP on 8067, your install will likely be different), gives me a ton to choose from. You'll need your API key in order to build queries. You can find yours via Tools | Options | API | API Key. 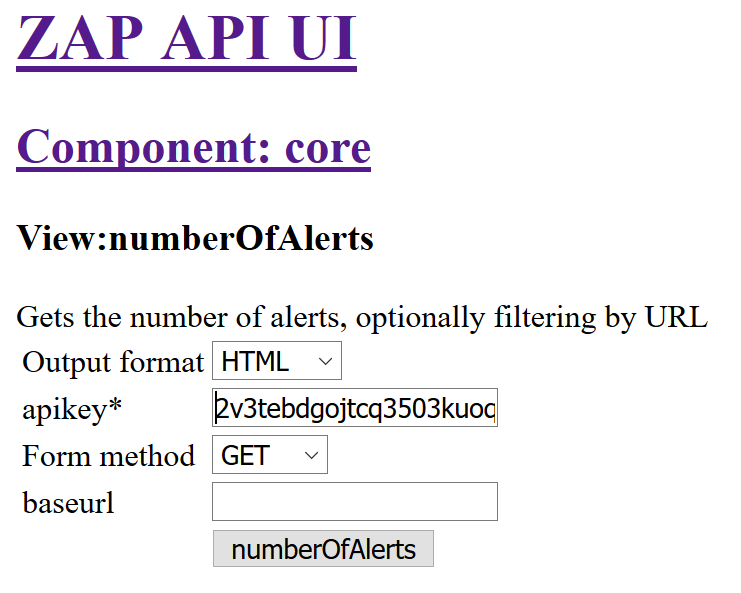 As an example, drill into numberOfAlerts (baseurl ), which gets the number of alerts, optionally filtering by URL. 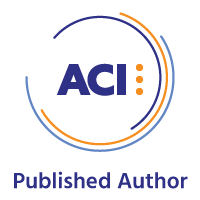 You'll then be presented with the query builder, where you can enter you key, define specific parameter, and decide your preferred output format including JSON, HTML, and XML. Sure, you'll receive results in your browser, this query will provide answers in HTML tables, but these aren't necessarily optimal for programmatic data consumption and manipulation. 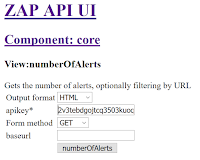 That said, you learn the most important part of this lesson, a fully populated OWASP ZAP API GET URL: http://localhost:8067/HTML/core/view/numberOfAlerts/?zapapiformat=HTML&apikey=2v3tebdgojtcq3503kuoq2lq5g&formMethod=GET&baseurl=. in HTML. Very straightforward and easy to modify per your preferences, but HTML results aren't very machine friendly. Want JSON results instead? Just swap out HTML with JSON in the URL, or just choose JSON in the builder. I'll tell you than I prefer working with JSON when I use the OWASP ZAP API via the likes of R. It's certainly the cleanest, machine-consumable option, though others may argue with me in favor of XML. Allow me to provide you an example with which you can experiment, one I'll likely continue to develop against as it's kind of cool for active reporting on OWASP ZAP scans in flight or on results when session complete. Note, all my code, crappy as it may be, is available for you on GitHub. I mean to say, this is really v0.1 stuff, so contribute and debug as you see fit. It's also important to note that OWASP ZAP needs to be running, either with an active scanning session, or a stored session you saved earlier. I scanned my website, holisticinfosec.org, and saved the session for regular use as I wrote this. You can even see reference to the saved session by location below. R users are likely aware of Shiny, a web application framework for R, and its dashboard capabilities. I also discovered that rCharts are designed to work interactively and beautifully within Shiny. 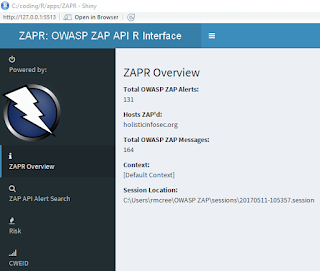 to pull data from the OWASP ZAP API. 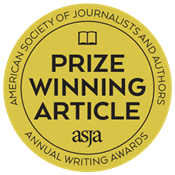 We use the fromJSON "function and its methods to read content in JSON format and de-serializes it into R objects", where the ZAP API URL is that content. I then combined all those results into another data frame I called reportDF, the results of which are seen in the figure below. Now we've got some content we can pivot on. First, let's summarize the findings and present them in their resplendent glory via ZAPR: OWASP ZAP API R Interface. You can see that we're simply using RJSONIO's fromJSON to make specific ZAP API call. The results are quite tidy, as seen below. One of my favorite features in Shiny is the renderDataTable function. When utilized in a Shiny dashboard, it makes filtering results a breeze, and thus is utilized as the first real feature in ZAPR. The code is tedious, review or play with it from GitHub, but the results should speak for themselves. I filtered the view by CWE ID 89, which in this case is a bit of a false positive, I have a very flat web site, no database, thank you very much. Nonetheless, good to have an example of what would definitely be a high risk finding. Alert filtering is nice, I'll add more results capabilities as I develop this further, but visualizations are important too. This is where rCharts really come to bear in Shiny as they are interactive. I've used the simplest examples, but you'll get the point. First, a few, wee lines of R as seen below. The results are much more satisfying to look at, and allow interactivity. Ramnath Vaidyanathan has done really nice work here. First, OWASP ZAP alerts pulled via the API are counted by risk in a bar chart. As I moused over Medium, we can see that there were specifically 17 results from my OWASP ZAP scan of holisticinfosec.org. Our second visualization are the CWE ID results by count, in an oft disdained but interactive pie chart (yes, I have some work to do on layout). As we learned earlier, I only had one CWE ID 89 hit during the session, and the visualization supports what we saw in the data table. 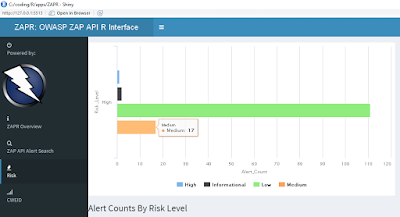 The possibilities are endless to pull data from the OWASP ZAP API and incorporate the results into any number of applications or report scenarios. I have a feeling there is a rich opportunity here with PowerBI, which I intend to explore. All the code is here, along with the OWASP ZAP session I refer to, so you can play with it for yourself. You'll need OWASP ZAP, R, and RStudio to make it all work together, let me know if you have questions or suggestions.